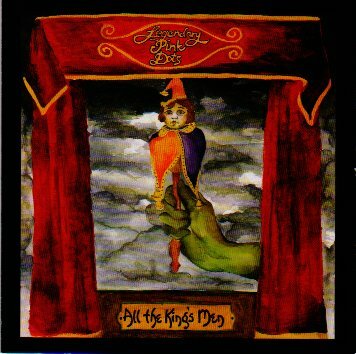 The Legendary Pink Dots, "All the King's Men"
Can we put Humpty Dumpty back together again? Early in 2001, Edward Ka-Spel imagined the following scenario: "a plane is about to crash & one of the unfortunate passengers feels the need to phone his wife on his mobile phone, only to receive her voicemail." All the King's Men (ROIR) and its sister release, All the King's Horses (Soleilmoon), are albums that were not only affected and inspired by the events of September 11th, but also eerily hinted at them. The body of work comprising these two releases was begun early in 2001 and was completed just three months ago. Thematically, the albums' connections aren't explicit or intended, but are related by the fact that both were created during a time when the world really did change. What you will find is a unique expression of awe, sorrow, and hopeNa paradox & a provocation. The world falls apart, yet affords us the opportunity to put it back together again. What should we do? Formed in 1980 in the UK, and shortly thereafter transplanted to Amsterdam, The Legendary Pink Dots are more together today than ever before. Constantly touring for 20 years on the Continent and USA, they have produced over 25 records on labels such as Play It Again Sam, Wax Trax, Staalplaat, Caroline, and Soleilmoon USA. Their leader, Edward Ka-Spel, a frequent collaborator with Skinny Puppy, has released albums of his own material and with Tear Garden (members of Skinny Puppy) on Nettwerk Capitol USA. Legions of adoring fans virtually assure a sellout crowd for the band's gigs. Their unusual mixture of electronic psychedelic whimsy and Alice In Wonderland playful, lush textural madness have kept them constantly on the top of the underground cult musical scene. Cross of fire drips down the door. Steer the street inside the law. My name in lights shall pose no threat. And look away with blind respect. Silly me forgot to duck! Cross of air, in line! Do you see three golden calves? Keep those eyes fixed to the floor!" Yes, I can see you channeling..."
Up here is not the place for you!" But I shall move these fingers! Stay in line...can you hear me? The Queen was looking very, very sad. I try a little less. Admitted: "Oh the lord, he moves in such mysterious ways." Now wasn't that a shame? We watch the sun dance on the ocean. But we know that they can't touch us. Flames dance across the horizon. We know that they can't hear us. Brighter than the stars above. Wrote the script down in my cradle. Sing of your cauldron of woe. You lick, then you blow. So was it my body? Or is it my mind? A space to be filled. Tell the world that the world loves a Cola. Lie there on the table. The world is yours, son. No fingers tap without control! Set us free, new man! Our superman! Show us the way, Superman!